Cormac Sharvin will carry home hopes into tomorrow’s Shootout Sunday at the Galgorm Resort & Spa Northern Ireland Open presented by Modest! Golf. 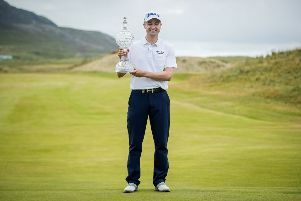 The Ardglass golfer will face Portugal’s Ricardo Santos in round one tomorrow morning for the chance to meet Chile’s Nico Geyger in round two. “I know Ricardo very well - I played a lot of Algarve Golf with him in the winter,” said the 24-year-old. “He’s a really nice guy and he is obviously very experienced. He has played a lot of years on the European Tour. Sharvin booked his place in today’s finale on the back of a fine five under par 66 that saw him move up 21 places on the leaderboard. He was the only Irish golfer to make the third round cut which fell at five under par. A five-man play-off for the two final spots was required to determine the top 24as the tournament now becomes a six-hole match play competition. 22 players, headed by Matthias Schwab, had sealed their spots, with Wil Besseling, Steven Brown, Julian Kunzenbacher, Max Orrin and Manuel Trappel all tied on five under par after 54 holes. Tournament ambassador Michael Hoey carded a third round one under par 70 to miss out as did Damien McGrane, Simon Thornton, Kevin Phelan and Neil O’Briain. Hoey intends to attend tomorrow, with an eye on seeing how the new format works out. “It’s good - it’s exciting - I really wanted to be in it because you never know what is going to happen,” he said. The top eight are all seeded into the second round of matches on Shootout Sunday. They are: Schwab, Riu, Nemecz, Kellett, Bradley Neil, Tom Murray, Nico Geyger and Alessandro Tadini. The first round of matches will be contested between the following players: Christian Braeunig, Jerôme Lando Casanova, Ashley Chesters, Sean Einhaus, Estanislao Goya, Daan Huizing, David Law, Thomas Linard, Matthew Nixon, Orrin, Martin Rohwer, Ricardo Santos, Cormac Sharvin, Robin Sciot-Siegrist, Trappel and Jeff Winther.